Heros and villains comp! "Why so serious??" 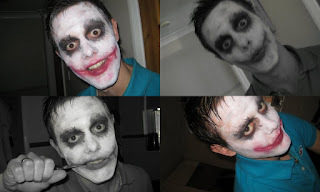 So i am running out of time to do this on myself but i so, so wanted to enter..then i rememberd a few months ago i did a look of the Joker on my friend for my fancy dress party! For the night we sprayed his hair green too! I created this look using a product called rigid collodium...it goes on wet and then dries crating a scared look...i lined this on his forehead...along the lips to make the famous scars and a bit under the eyes to add age to the look! Then literally all i used were white, red and black clown paints. I then used black eyeliner to deepen the colour of the eyes. To make the look look not so perfect white i then flicked the face with water..to create a sweaty,desheveled look!! wow, you did such a good job on him!!! Hi hon! Was so lovely to meet u @ TBS - are u going to Maybelline? I love your joker entry!